Friday, Oct 7, 6-9 p.m. Circus of the Elements at Saunders Park. Shuttle Service available from top of the hill down to the bay. This is the final art night for the 2016 season. BERGERON WINERY 359 Main St. Charles Klabunde, etchings. THE LIGHTHOUSE GRILL 355 Main St. Susan Mayclin Stephenson, acrylic on canvas. MOONSTONE CROSSING 529 Trinity St. Kathy Reid, straw art. Music by Tony Roach. NED SIMMONS GALLRY 380 Janis Court. 5-8 p.m. Final night of current plein air exhibit; bike raffle with winner announced at 8 p.m.; short ceremony at 7 p.m. for unveiling of Donor Rock and Donor Bench bronze plaques. Band TBA. 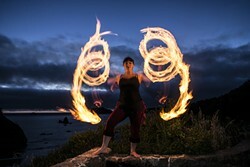 SAUNDER'S PARK (start of Patricks Point Drive) Fire Dancing by Circus of the Elements. 8:45 p.m.
SAUNDER'S PLAZA (Lot next to Murphy's) Music by Rosewater, a tribute to the Grateful Dead. SEASCAPE RESTAURANT 1 Bay St. "At the water's edge," Red Jioras, photography. STRAWBERRY ROCK GALLERY 343 Main St. Local artists. TRINIDAD ART GALLERY 490 Trinity St. Howdy Emmerson, paintings. Music by Howdy and JD Jeffries. TRINIDAD EATERY 607 Parker Road. "Beautiful Flowers and Birds," Augustus Clark, mixed media collage paintings. TRINIDAD MUSEUM 400 Janis Court at Patricks Point Drive. Preview of "Quillwork in Native American Baskets from Northwest California," at Trinidad Museum. TRINIDAD SCHOOL 300 Trinity St. "Boffer Ring," Kids and adults alike, Styrofoam swords and battle axes.